Who is Our Cesar Chavez? Who is Our Dolores Huerta? As 2011 approaches, let us take a moment to review 2000-2010 through a lens of Latino disempowerment. During this decade, our community has weathered firestorms ranging from anti-immigrant rhetoric, to financial extortion, to exclusion from the American educational system. Make no mistake, when politicians refuse to provide access to higher education for our community’s children, refuse to prevent mortgage lender usury, and refuse to fix a broken immigration system, they are disempowering Latinos. Through these instances, we have seen some leaders and politicians stand up on our behalf to advocate for reform. But as this Pew Hispanic Center study states we can’t even name them. This begs the questions: Who is our Cesar Chavez? Who is our Dolores Huerta? At the height of the civil rights movement, Dolores Huerta and Cesar Chavez banded together to do the unthinkable. Protesting on behalf of migrant workers who contended with workplace conditions we cannot begin to fathom, they caused a national boycott of grapes and threatened the entire California agricultural industry. Risking their lives and abilities to provide for their families, they made sacrifices that caused actual change. These civil rights icons embraced the role of David and crushed Goliath in a way our community has not seen since. And as we move forward, they are the type of leaders we desperately need but do not have. Simply stated, our community lacks national figureheads to spearhead reform efforts. While we rely on leaders such as NCLR’s Janet Murguía to beat the drums of change, she is restricted by the 501(c)(3) status of the National Council of La Raza. Murguía has been fighting for Latino rights for years and has done remarkable work. But she can only do so much when only bipartisan or even nonpartisan stances are requirements of her job description. Thus, all she and the NCLR can do is offer their resources and talents to policy discussions and court cases, and hope to empower their affiliates to create a grassroots level change like that of Chavez and Huerta. Now, this is not to say the Latino community has no activists, because we do. One need look no further than LULAC, NCLR, and NALEO conferences to see leaders from across the country come together each year to speak on the issues we face and how we’re fighting them. But we need more than conference workshops and networking events. While noble, they are just not enough. We need a Dolores Huerta and a Cesar Chavez because they would have protested and called for wide-scale economic boycotts of Arizona that a) actually would have worked and b) forced the repeal of the racist legislation the Arizona legislature continues to promulgate. They would have challenged Goliath, and they would have won. Unfortunately, we live in reality. And the reality is Gov. Jan Brewer was reelected. The reality is the DREAM Act remains a dream. The reality is immigration reform has not happened. And the reality is the Latino electorate, comprising the nation’s largest and fastest growing minority demographic, remains a sleeping giant. The status quo does not need to exist, but it lives on because we lack national advocates who are not afraid to, for lack of a better term, “throw down”. If this were the African-American community, leaders such as the Reverends Jesse Jackson and Al Sharpton would inundate the airwaves with an onslaught of calls for reform that would force people to listen. Leaders in academia such as Dr. Cornell West and Dr. Melissa Harris-Perry would join in the debate, calling for change and garnering attention to their cause. While they join us in our struggle, we cannot ask them to fight this fight for us. We need our Cesar Chavez and our Dolores Huerta, and we need them now. Matthew Stieglitz received his BA in Communication from the University of Delaware. He is currently a 2011 Master of Public Administration candidate at Cornell University concentrating in Government, Politics, & Policy Studies. After receiving his MPA Matthew will attend law school in order to merge his public affairs background with a legal education to most effectively advocate for Latinos. 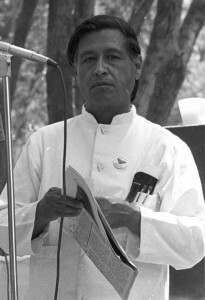 Photo Credit: Cesar Chavez at the Delano UFW rally, June 1974 by Joel Levine. Porque no te puedes habla sobre la revolucion?? I have no doubt that they will try to choose our leader for us in the future. When you see the media giving lots of attention to one person, you know that he’s somebody they approve of, somebody who can be controlled.